Meet your favourite characters, Iglepiggle, Upsy Daisy, Makka Pakka, the Tombliboos and many more from In The Night Garden... A magical nursery rhyme picture-book place that exists between waking and sleeping in a child's imagination. Episodes: Igglepiggle's Blanket in Makka Pakka's Ditch, Jumping for Everybody, Igglepiggle's Mucky Patch, The Pinky Ponk Adventure, Igglepiggle's Blanket Walks About By Itself, Too Loud Tombliboos! 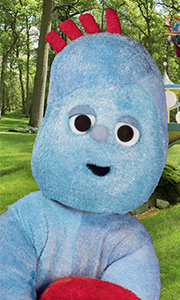 !, The ..
Five episodes of the CBeebies pre-school series narrated by Derek Jacobi, which takes children on an imaginative journey through the night garden, encountering its funny and lovable residents including Upsy Daisy, Igglepiggle, Makka Pakka, the Tombliboos, the Pontipines and the Haahoos. The episodes are: 'Igglepiggle's Blanket in Makka Pakka's Ditch', 'Jumping for Everybody', 'Igglepiggle's Mucky Patch', 'The Pinky Ponk Adventure' and '..
Own In The Night Garden - Hello Makka Pakka DVD from Deff, DVD, Blu-Ray & 4K Video Specialists - Free UK Delivery..
Own In The Night Garden - Hello Upsy Daisy DVD from Deff, DVD, Blu-Ray & 4K Video Specialists - Free UK Delivery..
Own In The Night Garden - Igglepiggle & Friends DVD from Deff, DVD, Blu-Ray & 4K Video Specialists - Free UK Delivery..
Own In The Night Garden - Igglepiggle Goes Visiting DVD from Deff, DVD, Blu-Ray & 4K Video Specialists - Free UK Delivery..
Own In The Night Garden - Igglepiggles Tiddle DVD from Deff, DVD, Blu-Ray & 4K Video Specialists - Free UK Delivery..
Own In The Night Garden - Magical Journeys - 10 Years Of Itng DVD from Deff, DVD, Blu-Ray & 4K Video Specialists - Free UK Delivery..
Meet your favourite characters, Igglepiggle, Upsy Daisy, Makka Pakka, the Tombliloos and many more from In The Night Garden... A magical nursery rhyme picture-book place that exists between waking and sleeping in a child's imagination. Let's join Makka Pakka as he makes a pile of six stones and then shows it to everyone. But oh no... Makka Pakka has lost his sponge. Where did it go? Travelling in the Pinky Ponk, the Tombliboos are drink..
Own In The Night Garden - Makka Pakka And The Ball DVD from Deff, DVD, Blu-Ray & 4K Video Specialists - Free UK Delivery..
Own In The Night Garden - Say Hello-Triple Set DVD from Deff, DVD, Blu-Ray & 4K Video Specialists - Free UK Delivery..
Own In The Night Garden - Upsy Daisy Only Wants To Sing DVD from Deff, DVD, Blu-Ray & 4K Video Specialists - Free UK Delivery..
Meet your favourite characters, Igglepiggle, Upsy Daisy, Makka Pakka, the Tombliboos and many more in The Night Garden... A magical nursery rhyme picture-book place that exists between waking and sleeping in a child's imagination. Watch as Igglepiggle tucks up in Upsy Daisy's bed. When she returns he has to jump out quickly. Then follow the Wottingers and the Pontipines as they look for each other. And join the Pontipines as they have t..
Own In The Night Garden - What A Funny Ninky Non DVD from Deff, DVD, Blu-Ray & 4K Video Specialists - Free UK Delivery..
Own In The Night Garden - Wheres Upsy Daisy Gone DVD from Deff, DVD, Blu-Ray & 4K Video Specialists - Free UK Delivery..
Own In The Night Garden - Whos Here? DVD from Deff, DVD, Blu-Ray & 4K Video Specialists - Free UK Delivery..
Own In The Night Garden - Windy Day In The Garden DVD from Deff, DVD, Blu-Ray & 4K Video Specialists - Free UK Delivery..